I'd love to have a bunch in a vase in my kitchen! What a beautiful close-up. Well captured! A nice splash of spring in the winter. Love that color. That is beautiful. I can imagine designers of THINGS being inspired by that color. Beautiful color. Seems especially bright on this bleak day. Here’s my Wordless Wednesday. Stop by, if you can, and share your thoughts. I bet it's nice to see a little color in the gloomy winter. beautiful happy color on a cold, cold day. Oh man, this looks like something out of a magazine. Candace, you are amazingly talented with the lens. 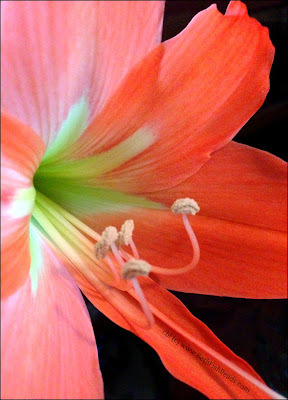 Beautiful close-up of the flower. I like the color, too. Thanks for dropping by and visiting. I'm now following you and will also participate in your Weekend Cooking posts!! Lovely. Such a gorgeous color. Your flower picture is beautiful. It's nice to see fresh color in winter rather than frozen trees like my WW. Another great macro shot! The colors are sublime. Very pretty! I wish I had some pretty flowers in the yard right now. wow - the color is amazing!